The Far Cry games are well-known for taking players to conflicted, war-torn parts of the world in order to fight for a rebellious cause, as was the case in 2014’s Far Cry 4, in which players took part in an armed conflict between a dictator and a group of rebels in a Himalayan country. These games have featured realistic action in a first-person perspective, and featured a large arsenal of modern weaponry which players could use in the game. But not all games in the series have sported realistic settings and featured firearms, as there have been two notable exceptions in the franchise so far. One was this year’s Far Cry Primal, which eschewed modern weaponry and vehicles in favour of bows and spears, as it took the series to the Stone Age (and actually did a pretty good job at it). The other Far Cry game that was unlike others in the series, was 2013’s spin-off Far Cry 3: Blood Dragon, which had an 80’s atmosphere, and fantasy weapons and enemies (like dinosaurs that shot lasers from their eyes…). It also had old-fashioned video game cutscenes bookending each of the game’s levels, which had a great retro charm, and also noteworthy was that the game’s main character was voiced by 80’s star Michael Biehn (from James Cameron’s original Terminator movie). 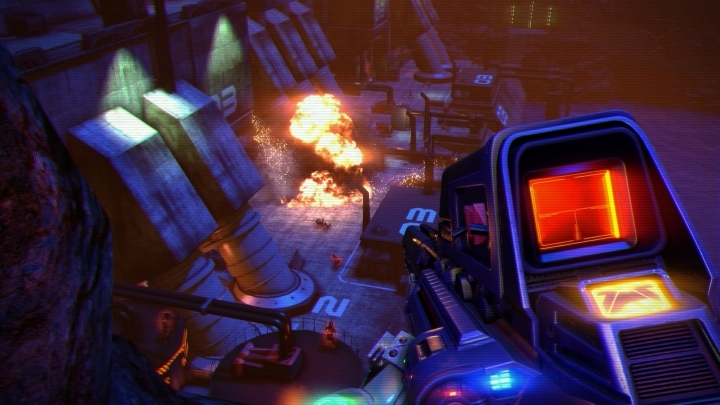 Actually, Far Cry 3: Blood Dragon is one of the franchise’s best entries and the sort of game that first-person shooter aficionados should not miss, so it’s a good thing that Ubisoft will be offering the game for free on PC on November 9, as the company stated in a recent tweet. This offer is part of Ubisoft’s celebration of its 30 year anniversary, and the French company has already given the likes of Beyond Good and Evil for free, with Ubisoft planning to release more games free of charge soon. In order to get Far Cry 3: Blood Dragon and other Ubisoft games which are part of this promotion, players have to visit this website and follow the instructions. Also, a Uplay account is needed in order to download and play the games. What is clear, though, is that Far Cry 3: Blood Dragon is one of the best action games in recent memory, so those who have the slightest interest in action video games or the 80’s could do a lot worse than get the game free of charge while Ubisoft’s 30th anniversary promotion is still going.